Wednesday nights are as exciting as ever as the WWE continues to display NXT on the WWE Network. This week was spent gearing up for the new live special that was announced for May 20th, NXT Takeover: Unstoppable. Each hard hitting match gave the winners huge boosts of momentum moving forward. Who benefited? Who’s night did not go as planned? Find out now! Kevin Owens and Sami Zayn Fight at NXT Takeover! The night began with NXT Champion, Kevin Owens. He was unhappy about how Sami Zayn had interfered last week just as he was about to finish Alex Riley off for good. 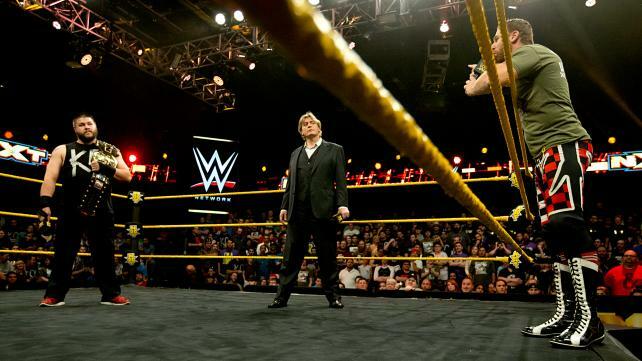 He called out Zayn to make him answer for what he did, but who he got was William regal. The General Manager attempted to calm the champion but Owens once again demanded that Zayn come out and face him. This time the leader of the Zayniacs arrived but before he could enter, Regal stopped him and told him that chaos would not break out like it did last week. Regal then announced that it was clear both men wanted to fight, and that at NXT Takeover, both competitors would get their chance to face one another for the NXT Championship. Kevin Owens balked at having to put his title on the line, but Sami took a page out of Owens playbook and insisted that he was a prize fighter and that Owens was NOT that prize. If Kevin wanted to fight, the title would have to be put on the line. Reluctantly, Kevin agreed to put the title on the line but promised that what he did to Sami their first match would be nothing compared to what he would do to him come May 20th. Big Cas and Enzo were looking to make an emphatic statement against the current NXT Tag Team Champions. At the start of the match, however, Blake and Murphy isolated Amore in their corner, effectively neutralizing the 7ft behemoth in the opposite corner. But you can’t keep a scrapper like Enzo down for long as he hit a jaw breaker on Murphy to create the space he needed to tag in his partner. From there, Big Cas cleaned house with a Big Boot and a huge slam. The end came for the tag team champions when Enzo took to the top rope after being tagged in, and then flew down with the added umph from Cas to pick up the win. Big things are in store for Colin and Enzo. If they keep this up those titles are there’s for sure. The only thing they really need to be aware of is the possible distraction of Carmella on the outside. Blake and Murphy are sure to use her to their advantage in an attempt to retain the NXT Tag Team Championships. The new Total Diva took on her biggest challenge yet. And she excelled as she was expected to do. Dana Brooke was not intimidated by facing the more seasoned Bayley and took the fight right to the superfan. Brooke showed in ring prowess above that of a normal newblet to the ring as she targeted Bayley’s previously injured knee. However, this lit a fire in the Hugger and she looked like she was going to put Dana away. But to the NXT Universe and Bayley’s surprise, Emma came out wearing Bayley’s shirt and head bands. This distraction allowed Brooke to hit a huge sit down powerbomb for the win. Dana Brooke is impressive. This was a much better showing than when she was in the ring against Blue Pants. This match was not meh in the slightest. Looking forward to seeing who is next to face Dana and how she handles them. I am intrigued over what is developing between Bayley and Emma. If anything, this should teach Bayley not to have friends any more. So far everyone she’s been friends with has screwed her over in the last few months. This was short sweet and to the point. Adam Rose attempted to confuse Hideo with his party god antics by rolling around the ring. Itami answered this nonsense with hard strikes with both his feet and his hands. Adam attempted to fight back as they traded moves for a moment but it was a drop kick to Rose in the corner that began to spell the end of this battle. Hideo followed it up with a shot gun kick and sent Adam Rose packing. Hideo looked awesome. Adam Rose was no major threat and he weathered anything that the leader of the Rosebuds threw at him. 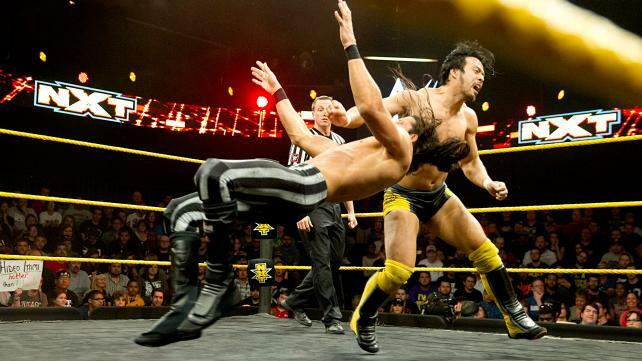 Hideo did pick up momentum towards his triple threat match for the #1 contender-ship for the NXT Championship at Takeover. But he has stout competition in Finn Balor and Tyler Breeze to contend with. Will be interesting to see how this develops down the line. As a debut goes, this could have been worse. But Sarah Dobson put up one helluva fight against the #1 contender to the NXT Women’s title. Becky Lynch however was in no mood to be any newblet’s road to glory. The Irish Rocker show cased her expertise in submissions and her unique offense as she ground Sarah down. In the end Lynch forced her opponent to tap as she locked in an armbar. Becky is on fire. This chick is quickly picking up speed on her road toward the show down with Sasha Banks. Sure she beat someone on her debut, but Sarah was no push over. With Sasha’s love of submission and Becky’s penchant for it as well, it would be fun to see the two women have a submission match. Who is the submission master in the NXT Women’s division? As things stand now, it’s a toss up. In a match made earlier in the night, Alex Riley stood face to face with the NXT Championship #1 contender while Kevin Owens sat in on commentary. Their bout was evenly matched with neither man gaining full advantage. Riley attempted to channel his rage into powerful moves and Sami countered with his speed and agility. The fight spilled out side the ring and all appeared to be in the bag for Zayn as he fly over the top rope and knocked A-Ry to the ground dazing him. Kevin Owens took this moment to make his move. He pounced on Zayn and forced the disqualification in his attack on the #1 contender. KO then turned his attention to Alex as he took up the former commentator and power bombed him on the ring apron, in much the same fashion that took Sami out for a month. The NXT Champion then celebrated his attack on both men. The match between Sami and Alex was actually a very good one. Both men work well in the ring together and you wanted to see them tear into one another. You could tell that they both wanted to use the other as a stepping stone on their path to NXT Champion, Kevin Owens. But in the end it was Owens who got the last laugh on both men. 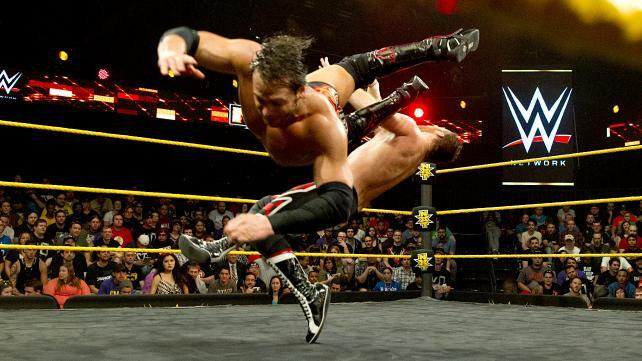 WWE: NXT 6/17/15 Recap!! All Hell Breaks Loose!! This entry was posted on Thursday, April 30th, 2015 at 1:46 pm	and is filed under Events, News, Television. You can follow any responses to this entry through the RSS 2.0 feed. You can skip to the end and leave a response. Pinging is currently not allowed. « Vin Diesel’s Latest ‘The Last Witch Hunter’ Trailer Is Awesome!!!! I'm gonna hit the brakes and he'll fly right by.